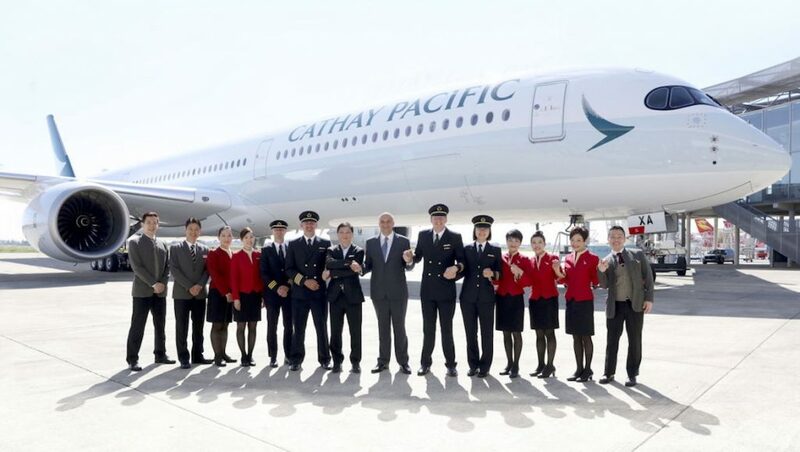 Cathay Pacific has become the second airline in the world and first in Asia-Pacific to take delivery of the Airbus A350-1000. 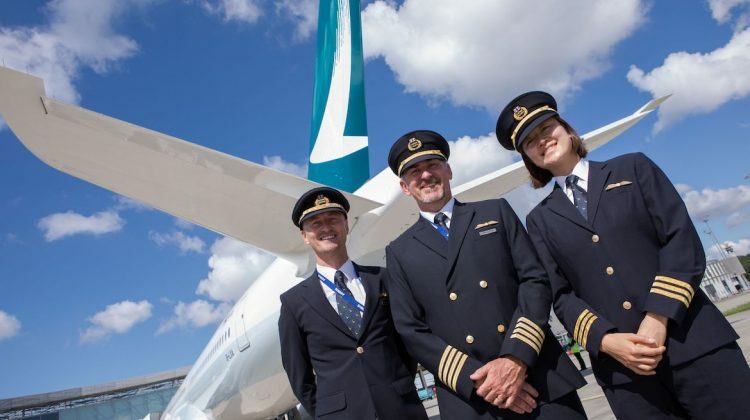 The delivery flight of B-LXA took off from Airbus’s Toulouse headquarters with airline staff and media on board a little after 1440 on Tuesday (European time), landing at Hong Kong Airport about 12 hours later on Wednesday morning. Some scenes from the delivery flight and arrival in Hong Kong on Twitter from CAPA – Centre for Aviation analyst Will Horton, and South China Morning Post reporter Danny Lee, who were on the delivery flight. 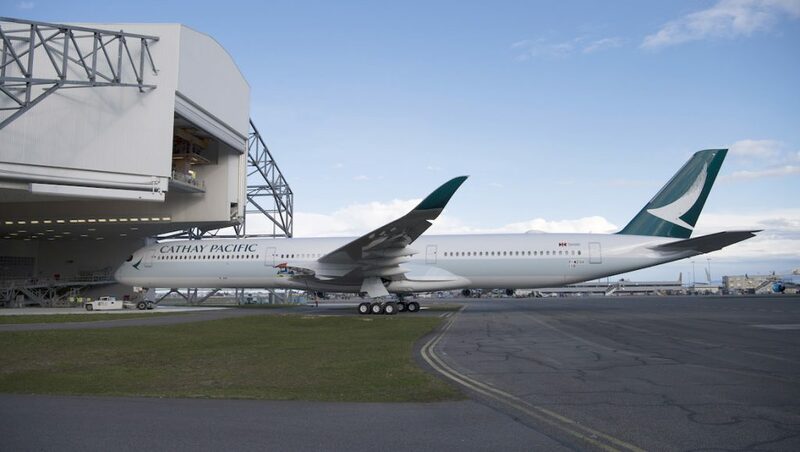 Cathay Pacific has 20 A350-1000s on order, with eight of the type to be delivered by the end of calendar 2018 and the remaining 12 to arrive by 2021. The A350-1000 is 73.78m in length, 6.98m longer than the A350-900, and is designed to fly 7,950nm carrying 366 passengers, according to Airbus figures. 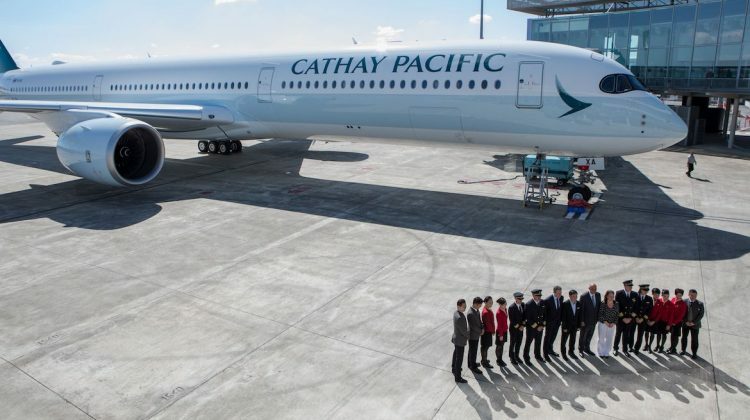 Cathay Pacific has configured its A350-1000 to carry 334 passengers comprising 46 business in a 1-2-1 layout with direct aisle access for every passenger, 32 in premium economy at eight abreast and 256 in economy with nine seats per row. It has 54 more seats than Cathay Pacific’s 280-seat A350-900s (38 business, 28 premium economy and 214 economy). Cathay Pacific chief customer and commercial officer Paul Loo said the entry-into-service of the A350-1000 built upon the airline’s successful induction of A350-900, which had allowed the airline to expand its long-haul network at a “near unprecedented rate”. 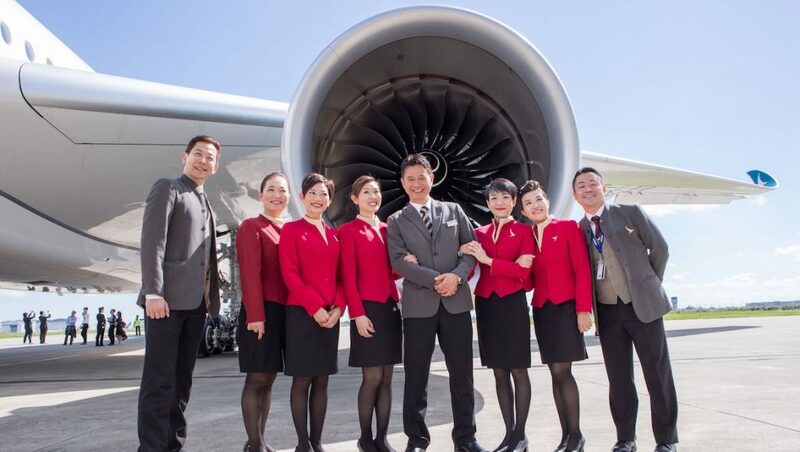 “The -1000 is very similar to the -900 in terms of its operational excellence,” Loo said in a statement. The A350-900, which Cathay Pacific began operating in May 2016, has led to new nonstop services from Hong Kong to Barcelona, Brussels, Christchurch, Copenhagen, Dublin, London Gatwick and Tel Aviv. The airline currently has 22 A350-900s in its fleet. It has also been used to upgauge flights to Australia, with the A350-900 replacing 251-seat Airbus A330-300s (39 business, 21 premium economy, 191 economy) on some flights to Brisbane, Melbourne and Perth. Cathay Pacific general manager for South West Pacific Rakesh Raicar said in February the A350-1000 could potentially be used on the Hong Kong-Sydney route, which is currently served three times daily with three-class 340-seat Boeing 777-300ERs, (40 business, 32 premium economy, 268 economy) and once daily with the A330-300. “That one flight we are still operating with the A330, I don’t need to make any guesses what the planning could be for 2018,” Raicar told reporters in Sydney on February 1. “It’s not confirmed, but I would say that’s an ideal candidate for an A350-1000, so Sydney might see an A350-1000 this year. Cathay Pacific has utilised all available traffic rights to Australia for Hong Kong-based carriers, meaning the only way to grow its presence is to utilise larger aircraft. The A350-1000 will initially be used on short-haul flights to Taipei starting in July. The first long-haul route will be Hong Kong-Washington DC, which is set to begin in September 2018. At 7,085nm, it will be the longest route by distance in the airline’s network. Other destinations due to receive A350-1000 service in the period ahead included Amsterdam, Madrid, Manchester, Tel Aviv and Zurich. 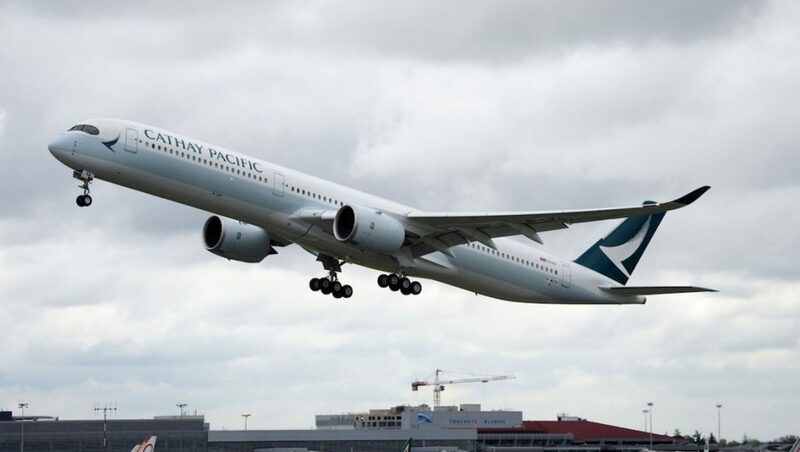 As with the delivery of all of Cathay Pacific’s 22 A350-900s, the delivery flight of B-LXA included the use of a biofuel blend to power the aircraft’s two Rolls-Royce Trent XWB-97 engines. Qatar Airways was the launch customer for the A350-1000, with the airline taking delivery of the first of the type in February 2018. At May 31 2018, Airbus had secured 847 orders A350, comprising 679 for the A350-900 and 168 for the A350-1000. Of those 174 aircraft have been delivered. 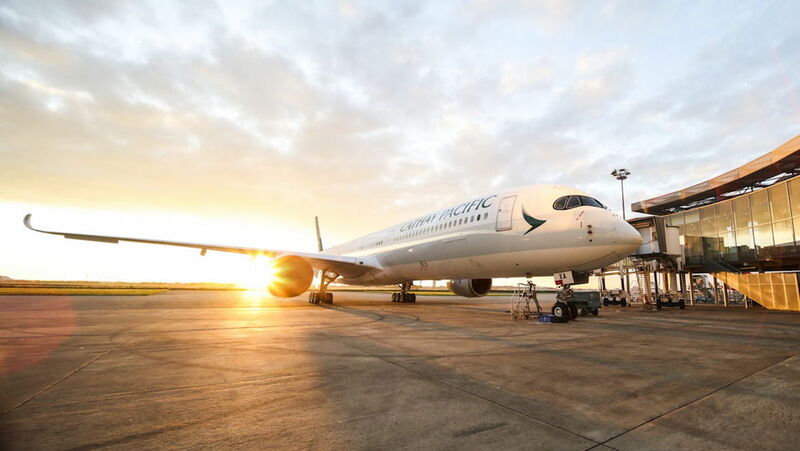 VIDEO: A look at the making of Cathay Pacific’s first Airbus A350-1000 from Airbus’s YouTube channel. Interesting that Qatar is not seen as part of the Asia Pacific. Qatar is in Asia, so where does Asia Pacific begin and end. @Patrick Kilby Is assume Asia pacific ends at the Indian Ocean. India and west from there would be classed as another area. Patrick…. Maybe once it turns into the Indian Ocean?!?!? Apologies for the error. The story has been updated. It is interesting that Airbus are now saying that they are looking at the A350 XWB as a whole to meet Qantas’ Project Sunrise. Given the limitations of the A350-900ULR outlined in the latest ULR spec (no forward cargo hold), it seems that Airbus are looking more at what they can do to tweek the A350-1000 to meet sunrise’s requirements and follow on ULR needs of other airlines such as ANZ and UAL for starters. What is the performance of the a350 engine v the GE90 on the 777/77x ?